Lush Cosmetics believes in making effective products from fresh, organic fruit and vegetables, the finest essential oils and safe synthetics. 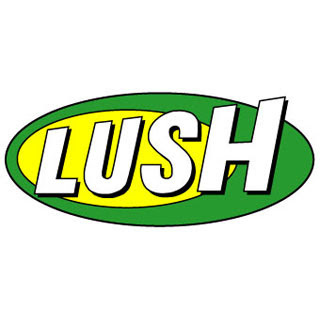 Lush invents their own products and fragrances. They make them fresh by hand using little or no preservative or packaging, using only vegetarian ingredients, and they tell you exactly when they were made. Their soaps are unique, their bath balms are creative and exciting, and they also carry fragrances, shower gels, skin care and so much more! I'm like a kid in a candy store at Lush. The Creamy Candy Bubble Bar ($7.25) For fluffy white mountains of creamy, candy-scented bubbles, crumble a Creamy Candy Bar under running water and climb in. This sweet, pink,heavenly treat smells like a vanilla candy and is sure to make you smile. It smells delicious and contains cocoa butter and almond oil for supremely softened skin. If you need a pick-me-up, you're sure to be delighted by Creamy Candy. Lush's Bubble bars lather up so nicely, and leave you smelling like a delicious candy bar. But not too sweet! Still clean and fresh smelling. Words can't explain how much I'm loving Lush's Bubble Bars. Lush's Dreamwash ($19.95) is a creamy Smoothie made for those of you with sensitive, itchy, rashy and sunburnt skin. Lush put the most soothing ingredients in for optimal results, including calamine powder, aloe vera gel, rose and chamomile. It smells rather herby because it's full of herbs. Lather this soft pink soap all over to calm down your skin and when you're done in the shower, rub on our best-selling body lotion Dream Cream to make your skin so happy it'll think it's dreaming. This is a smoothie almost yummy enough to eat. Will leave you smelling fresh all day, this is a new favorite of mine. Perfect for dry, sensitive skin. The Candy Fluff Dusting Powder is my absolute favorite product from LUSH Cosmetics. Now even if you don't like candy, sugary smells, you will love the candy fluff scent. Yes, it does smell of sweet candy, but it also smells fresh and clean. Trying to find words to describe how this smells, I'm at a loss. It's too perfect to put into words. I will be a repeat customer of this product. If you look at the above pic of my arm, this is how the dusting powder looks when you lightly put some on your skin. Rubbing it will then create a sparkly look, but not overly glittered. You can apply this anywhere you need a little sparkle, over a fresh, fluffy smell. I used this right after the shower over a light moisturizer which holds the glitter well.